Bra-Top Dress & Jacket for Genesis 2 Female for use in Daz Studio 4.6. 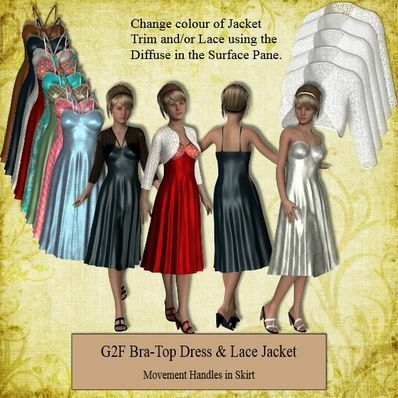 Change colour of Lace Jacket using Diffuse in the Surfaces Tab. Beautiful dresses! Keep up the great work. Thank you for sharing. Your designs are all excellent. You do amazing work! I've used them in the past from sharegc, but it is great to see them on your well-designed website! Just love this lace jacket, it is superb. Love the dress. Great for party scenes! Thanks! Thank you, G2 is already for the holidays with this lovely outfit! Thank you very much. Lovely dress. Well made..it's lovely..love the lace jacket!! Thank you so much!! I agree with with everyone's comments, Excellent. Thanks to you, my G2 characters have clothing. Marvelous work! Lovely Dress. Thanks a lot! Just right for the coming holidays ^^ Thank you for this great combination! Very beautiful, thank you! The dress is really elegant, and the jacket is lovely. What a beautiful dress to wear to the Holiday parties this year :) Thank you!